Airing a commercial during the Super Bowl broadcast is incredibly expensive, with CBS charging an average of $5.25-million for a 30-second spot during the big game and while pricing has been high for years, FCA has been one of the most active automotive advertisers. It seems as though that will be the case once again for Super Bowl 53, with FCA releasing three commercials serving as part of their “big game blitz” along with the promise of a new commercial during the game. Today, we bring you a look at the Dodge commercial of that group. 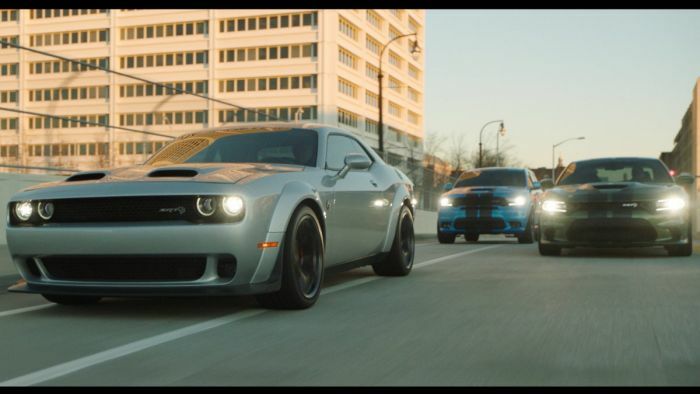 This new Dodge commercial is titled “Georgia” and it stars the Dodge Challenger SRT Hellcat, the Dodge Charger SRT Hellcat and the Dodge Durango SRT. At first, the Challenger is tearing up the streets, drifting around turns with the supercharged engine roaring and the tires screaming. Next, a Dodge Charger Hellcat shows up, slipping and sliding its way around the unnamed city and the 475-horsepower Durango is the third to show up. The vehicles come together, riding in formation as they race to the big game in Georgia. We don’t know what FCA has planned for the Super Bowl broadcast, but it looks as though there are some high performance machines headed that way. Perhaps all of this power will be showcased in another commercial that debuts during Super Bowl 53, but FCA also has Ram and Jeep commercials that are included in this series. In other words, we have no idea what FCA has in store for the game, but in the meantime, the Dodge brand has rolled out another adrenaline-filled commercial chock full of high performance Hemi-powered vehicles.